Nuclear Watch New Mexico has filed a lawsuit in federal court against the Department of Energy and Los Alamos National Security LLC (LANS), the for-profit operator of the Los Alamos National Laboratory, over their failure to meet cleanup milestones under a 2005 “Consent Order” they agreed to with the New Mexico Environment Department. The New Mexico Environmental Law Center is representing NukeWatch in this legal action to enforce cleanup at LANL. Today, the New Mexico Environment Department (NMED) issued a new draft Consent Order that in theory will govern cleanup at the Los Alamos National Laboratory (LANL). Instead, the new Consent Order is a giveaway to the Department of Energy and the Lab who are intent on creating yet more radioactive waste from expanded nuclear weapons production. Today, Nuclear Watch New Mexico notified the Department of Energy (DOE) and the Los Alamos National Laboratory (LANL) that it will file a lawsuit over their failure to meet cleanup milestones under a “Consent Order” governed by the New Mexico Environment Department. Formal notice is required before a lawsuit can actually be filed, which NukeWatch intends to do within 60 days or less. The New Mexico Environmental Law Center is representing NukeWatch in this legal action to enforce cleanup at LANL. Jay Coghlan, Director of Nuclear Watch New Mexico, commented, "This dooms the Lab to cleanup on the cheap. This 140 million dollars per year to the cleanup contractor is based on a revised Consent Order by the New Mexico Environment Department that was a give away to the Los Alamos Lab. The original 2005 Consent Order held the Department of Energy's feet to the fire to complete real cleanup or pay stipulated penalties. In contrast, the Martinez administration gave the biggest polluter in northern New Mexico a free pass, forgiving a hundred million dollars in possible fines that should have gone to our kids' schools. New Mexicans deserve an Environment Department under a new governor that aggressively protects the environment and creates new high-paying jobs thorough enforcing comprehensive cleanup." "The incident highlighted, once again, a pattern of consistent mismanagement in the maintenance and cleanup of some of the most dangerous materials on Earth. "This pattern of problems also has prompted the Defense Nuclear Facilities Safety Board to question whether the facility should continue to operate and handle increasing quantities of plutonium in coming years. On Friday, the board said it will hold a June 7 hearing in Santa Fe to question a number of experts about the lab's ability to safely carry out future nuclear missions at PF-4 (the "plutonium building")... The Department of Energy plans to increase manufacturing of plutonium pits at Los Alamos over the coming decades. Two test pits were built last year, and as many as 50 to 80 pits could be built each year by 2030, a significant ramp up in the presence and handling of highly radioactive plutonium. "...The DOE report is far from honest. It intentionally omits any mention of approximately 150,000 cubic meters of poorly characterized radioactive and toxic wastes just at Area G alone (LANL's largest waste dump), an amount of wastes 30 times larger than DOE acknowledges in the 2016 Lifecycle Cost Estimate. In reality, DOE and LANL plan to not clean up Area G, instead installing an "engineered cover" and leaving the wastes permanently buried. This will create a permanent nuclear waste dump above the regional groundwater aquifer, three miles uphill from the Rio Grande. Radioactive and toxic wastes are buried directly in the ground without liners, and migration of plutonium has been detected 200 feet below Area G's surface..."
"Santa Fe, NM. The Department of Energy (DOE) has announced that the cost of "Remaining Legacy Cleanup" of radioactive and toxic wastes from more than 70 years of nuclear weapons research and production at the Los Alamos National Laboratory (LANL) will cost $2.9 billion through fiscal year 2035, averaging $153 million per year. "Nuclear Watch New Mexico has amended its federal lawsuit against the Department of Energy (DOE) and Los Alamos National Security, LLC (LANS) that alleges twelve violations of a 2005 Consent Order governing cleanup at the Los Alamos National Laboratory (LANL). Those violations could result in potential penalties of more than $300 million dollars that would go to the state, if only the New Mexico Environment Department (NMED) were to enforce them. Nuclear Watch now asks the court to declare the new 2016 Consent Order to be invalid because the requirement for the opportunity of a public hearing was not met." "The new Consent Order is a giveaway to the Department of Energy and the Lab, surrendering the strong enforceability of the old Consent Order. The new Order is also clearly the opposite of the old Consent Order, whose underlying intent was to make DOE and LANL get more money from Congress for accelerated cleanup. In contrast, the new Consent Order allows them to get out of future cleanup by simply claiming that it's too expensive or impractical to clean up..."
On March 30, 2016, the New Mexico Environment Department (NMED) released for public comment its proposed 2016 Compliance Order on Consent ("Consent Order") governing cleanup at the Los Alamos National Laboratory (LANL). If implemented, the revised Consent Order will almost certainly create serious barriers to achieving cleanup, especially given the Lab's known opposition to full and complete cleanup. In addition, the proposed revised Consent Order limits public participation opportunities; undermines enforceability by the Environment Department; puts the Department of Energy (DOE) in the driver's seat; and lacks a final milestone compliance date. The proposed 2016 Consent Order is potentially a giant step backwards if the goal is to achieve genuine, comprehensive cleanup at LANL. Thanks to all of you that sent in your comments. We await NMED's response to all submitted comments. Following protracted negotiations, threatened litigation, and claims of imminent and substantial endangerment, the New Mexican Environment Department (NMED), the Department of Energy (DOE) and the Los Alamos National Laboratory contractor agreed to sign the original Consent Order in March 2005. Its promise was fence-to-fence cleanup of Cold War legacy waste at Los Alamos. The 2005 Consent Order was designed as a plan-to-make-a-plan, with investigations followed by cleanup and with hundreds of specific milestones. The intent was to convince DOE to increase funding for LANL cleanup by making a complete cleanup schedule subject to enforcement. The Consent Order had a "final compliance date" scheduled for December 6, 2015. Santa Fe, NM. Today, Nuclear Watch New Mexico notified the Department of Energy (DOE) and the Los Alamos National Laboratory (LANL) that it will file a lawsuit over their failure to meet cleanup milestones under a "Consent Order" governed by the New Mexico Environment Department. Formal notice is required before a lawsuit can actually be filed, which NukeWatch intends to do within 60 days or less. The New Mexico Environmental Law Center is representing NukeWatch in this legal action to enforce cleanup at LANL. "Had the cleanup at Los Alamos National Laboratory gone as planned, this weekend would have marked the closure of a decade-long effort to remediate the effects of a 70-year legacy of making and maintaining nuclear bombs. Instead, the deadline stated in the 2005 consent order, an agreement between the US Department of Energy and the lab on how and when to clean up radioactive and toxic waste stored on site, often in unlined pits, trenches and shafts, and the contaminated buildings that housed lab operations, for the last major project, a cleanup of the largest waste dump site at the lab, came and went on Dec. 6. Instead, that milestone is still decades and millions of dollars away, and the state and federal government are beginning discussions to draft a new plan and schedule for it. "The concern is that the longer this cleanup is postponed, the more it will fade from memory, and the less people will think to argue for a cleanup that could bring jobs to the area now, and protect its groundwater for the long term. "'We hear that we can't afford to do cleanup and at the same time the US government is ready to embark on a trillion dollar modernization of nuclear forces, so budget arguments against cleanup ring pretty hollow in our view,' Coghlan says. 'Go ask the public what they want, and ask northern New Mexicans what they want. They want cleanup over weapons.'" "Sunday's deadline focused on Area G, LANL's largest waste deposit site. A local watchdog group, Nuclear Watch New Mexico, said comprehensive cleanup for the site 'is still decades away.' In a statement released Monday, Nuclear Watch stressed the need for public participation in the revised cleanup order, including a public hearing, and condemned a plan proposed by LANL to 'cap and cover' waste in Area G. 'Cleanup just keeps being delayed. If not corrected, cleanup simply won't happen,' said Jay Coghlan, executive director of Nuclear Watch. 'Nobody ever thought cleanup would be fully completed by the end of 2015; nobody is under any illusions about that.'" he added. "Progress on cleanup of material at the Los Alamos National Laboratory left over from manufacturing the world's first nuclear weapons has been impeded by limited budgets, the discovery of new plumes of contamination and a guiding document that, according to the state, prioritized studying problems over fixing them. With that document- the 2005 consent order agreed to by the US Department of Energy, LANL and the New Mexico Environment Department- riddled with unmet deadlines and unfulfilled goals and set to expire at the end of the year, the state is beginning discussions on a new approach aimed at producing more results..."
At a meeting of the Regional Coalition of LANL Communities on Nov 13, Doug Hintze, the new manager of the Department of Energy's Environmental Management field office in Los Alamos, said priorities were safety, transparency and efficiency. "We have stuff in the ground that we all agree should be gotten rid of. What do we do and what time does it take in order to get rid of it? Whatever funding we get, we need to be good stewards." Nuclear Watch New Mexico said it will be "pushing for concrete milestones that are set from the beginning for all actions, for penalties when deadlines are not met, and for a new final end date. The revised Consent Order cannot be open-ended, and actual removal of the wastes (not cap and cover) is important." The 2005 Consent Order governing LANL cleanup is expiring in December- And little progress has been made. The New Mexico Environmental Department is in talks with DOE and LANL on revisions / renewal to the 10 year-old agreement. Nukewatch is calling for a full public comment period on changes to the 10 year-old order. The 2005 consent order was LANL's agreement for "fence-to-fence" cleanup of Cold War-era legacy waste by December 2015. That hasn't happened, and all the agencies and parties involved have known for years the 2015 goals wouldn't be met. Now, as milestones for progress established under the 10-year-old consent order are set to run out in December, the New Mexico Environment Department is working on a revised agreement with the federal Department of Energy and Los Alamos National Laboratory over the huge undertaking of cleanup of decades of hazardous waste at the lab. New Mexico Environment Department officials say what they want is a more "performance-oriented" document that will generate actual cleanup or remediation of radioactive and other kinds of waste rather than focusing on preparatory work that only sets the stage. Nukewatch supports NMED's determination to get on with actual cleanup and remediation, but is calling for a full period of public comment on a revised agreement- so that, for example, alternatives to the lab's proposed 'cap and cover' remedy are fully explored prior to fixing cleanup modalities. Jay Coghlan, Executive Director of NukeWatch, said the rigorous public participation rules "get to disagreements before there is a done deal." Nuke Watch wants to assure that the public has "a role in defining a matter of public interest- cleanup at Los Alamos to protect our water supply... Can we be confident that the environment department is going to meet the genuine expectations of the public and that the lab will thoroughly be cleaned up? The answer to that is no." In a formal statement, NMED said, "We've received Nuclear Watch's letter indicating that they believe that the revision of the CO agreement should be treated as a permit renewal instead, with public involvement to include full, year-long adjudicative hearings, and we are taking that point of view into consideration because we agree that active public involvement improves outcomes." We're informed by Taos Town Councillor Andrew Gonzales that the Taos Town Council passed a similar resolution Dec 10. Taos County Board of Commissioners has passed a similar resolution. Santa Fe, Nov. 8. Mayor David Coss, in his role as Chairman of the Regional Coalition of Los Alamos National Laboratory (LANL) Communities, presented a draft City of Santa Fe resolution at their monthly meeting Nov. 7, calling for LANL's consideration of other alternatives to their proposed Technical Area (TA)-54, Area G, remedial action plan... The draft resolution urges LANL to execute full characterization and excavation of the wastes as well as offsite disposal of any high-level or transuranic radioactive waste and the reburial of remaining low level radioactive wastes in a modern landfill designed to control and prevent the migration of these wastes into groundwater aquifers and the Rio Grande. "Full cleanup of Area G would be a win-win for New Mexicans, permanently protecting our precious groundwater and the Rio Grande while creating hundreds of high paying jobs for twenty years or more," said Mayor David Coss. Mayor Coss will ask the City of Santa Fe Council for approval of this resolution at their December 11th meeting, which is open to the public. In letters to state representatives Udall and Egolf, Santa Fe Mayoral Candidate Javier Gonzales endorsed the City Council resolution, and called for state legislative hearings on dealing with hazardous waste at LANL's Area G. View letters (PDFs): To Rep. Udall, to Rep. Egolf. ABQJournal story on passage of resolution: "Resolution Urges Removal of LANL Waste". Santa Fe New Mexican: "Coss pushes for LANL's nuclear waste cleanup"
Los Alamos Monitor: "Coss' LANL resolution gets mixed reaction- Lab Officials say they evaluated all alternatives"
In a written statement, LANL said: "Under the Consent Order, the final remedy at Area G will be decided by the state of New Mexico after receiving input from the public. As that process continues, our sampling and monitoring to date- the results of which are all public- have shown that the buried material is safe where it is, now and for the foreseeable future." 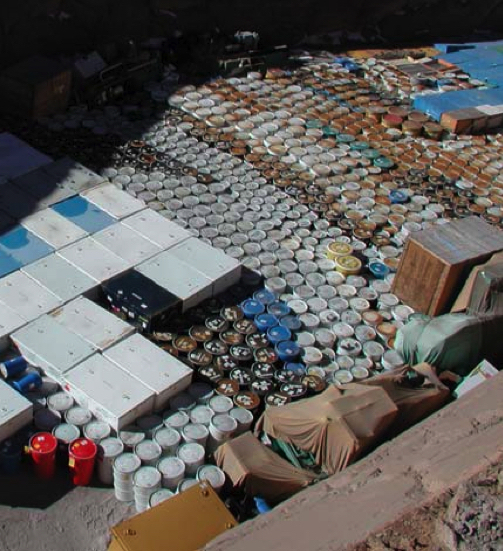 The Corrective Measures Evaluation Report for Material Disposal Area G, Consolidated Unit 54-013(b)-99, at Technical Area 54, Revision 3 was released in September 2011. It's document numbers are ERID-206324, LA-UR-11-4910, and EP2011-0284. This is the document where LANL states its preference to leave the one million cubic meters of radioactive and hazardous waste buried in place at the Lab at Area G.
This outtake lists the Area G Subsurface Disposal Unit Information for the Pits and the Shafts. It's a good history of what is known about the wastes, and lists the dimensions of the pits and shafts, giving a good picture of the size of the problem. This gives the locations of regional and intermediate wells in the vicinity of Area G and the lines of section for geologic cross-sections of the complex ground under Area G. Of particular interest is cross-section A-A' (Figure E-2.1-2), that shows an unknown vertical feature discovered when Well R-22 was drilled. Check out the vertical red feature with the question mark that intersects R-22. This gives an idea of how complicated the geology and how many questions that are still unanswered. This includes $9.7 billion in "Contingency" and $7 billion in "Professional Management"
Let us know if you have any questions or find anything in particular of interest.